Synopsis: Fir profile and specifics on use, history, and aroma of several Fir trees and includes chemistry and hydrosol. 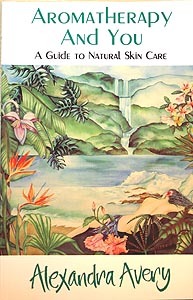 Essential oils to examine are courtesy of Eden Botanicals. Abies balsamea or Balsam fir is a North American fir, native to most of eastern and central Canada and the northeastern United States. Balsamea means it produces balsam from the bark. Fir, Silver SD or Abies alba, the European silver fir or silver fir is a fir native to the mountains of Europe, from the Pyrenees north to Normandy and east to the Alps and the Carpathians as well as south to Italy Bulgaria and northern Greece. Safety Precautions: Use moderately in your blends and perfumes. Remember that the conifer needle oils contain alpha- and beta-pinene and have been known to cause sensitivity and skin irritation in some. There is something richly evocative of the forest in the scent of the Balsam Fir needle absolute. Woody, conifer, green, somewhat vegetative, earthy and deeply scented of the forest – a wonderful oil to use in a perfume. The Balsam Fir steam-distilled oil is very similar to other conifer needle oils and hard to differentiate if you do not have 5-6 to compare. It is, of course, green, conifer, slightly vegetative and herbaceous with that sweet airy note we smell as we walk in the conifer forest. So these Fir and Pine oils can pretty much be used interchangeably. The essential oil of white Fir Abies alba, is clear and colorless, fragrant with the notes of the forest, green and heady. After smelling other conifer needle oils this one has a sweet and heady scent. A resinous essential oil can also be extracted. This conifer-scented oil has soothing qualities and is used in perfumes, bath products, and aerosol inhalants. Choose the one that you like best to use. I have a special kit of 20 Conifer oils for sampling – the cost is $140 and needs to be pre-ordered. But for trying out different Conifer scents it is the best. Best method of application and Properties or what do you use each for. With the alpha- and beta- pinene in these oils, you really can’t go wrong. Just choose the one whose scent is most pleasing to you. The essential oil of Silver Fir needle oil, is clear and colorless, fragrant with the notes of the forest, green and sweet. This conifer-scented oil has soothing qualities and is used in perfumery, bath products, and aerosol inhalants especially for the health of the respiratory system. The cone and leaf oil are steam-distilled in the Tyrol area of Austria from carefully harvested and maintained forests. Young twigs and leaves have a delightful odor. This EO is used in all kinds of ‘pine’ compositions such as room sprays, deodorants, and baths. 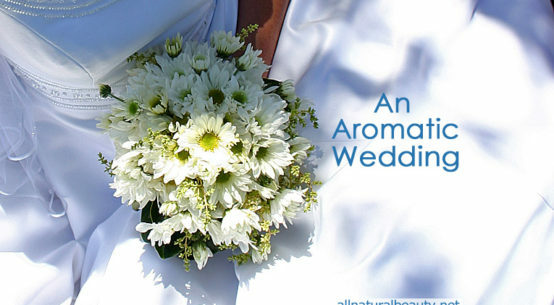 In Aromatherapy it is used for inhalation for respiratory ailments, colds, etc. ; and used externally, in preparations for rheumatism, aching muscles and other muscular-skeletal ailments. The cone oil has a suave balsamic odor and serves as an adjunct in all kinds of ‘pine’ needle scents. Balsam Fir produces Turpentine oil and Turpentine oils are produced both from Abies balsamea called Canada Balsam Fir andPseudotsuga taxifolia. This product is a true turpentine because it consists of both resin and volatile oil. The component is principally l-a-Pinene. 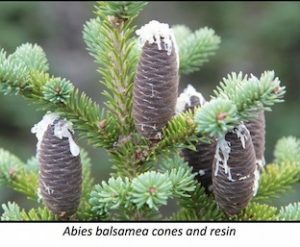 Abies balsamea is Balsam Fir contains up to 90% Monoterpenes. Like the other needle oils, it is antiseptic and antispasmodic and is inhaled for the respiratory system or applied externally in blends to ease the muscular system. 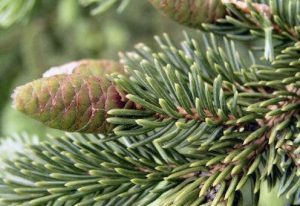 Balsam fir essential oil has a characteristic woody aroma. This oil usually contains between 6-9% of bornyl acetate and over 1% santene. The most common problems encountered with coniferous tree oil are contamination with other species during distillation and also misidentification of the distilled species. 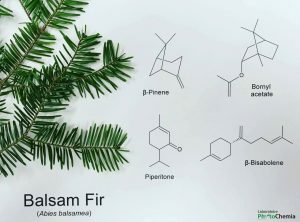 So, in a genuine balsam fir oil, it’s always important to have β-bisabolene, piperitone, and longifolene which are signature compounds for this species. Obviously, we also find commons monoterpenes in A. balsamea oil like β-pinene (the major component), α-pinene, camphene, myrcene, Δ3-carene. Hydrosol Uses: The conifers, especially the needle oils, when steam- or hydro-distilled yield a quantity of hydrosol. These hydrosols are very useful in a steam bath for the respiratory system, in a bath just for soaking and as part of the water in the Neti pot for cleansing the sinus. The hydrosol is used in baths, steam inhalations, compresses to soothe the skin, ease muscle tension and just to make you feel good as you inhale the forest. It is not hard to use and doesn’t need a lot of instruction. Just get the hydrosol — taste it or drink small amounts occasionally (1 oz./8 oz. water) for a cold or flu, pour into the bath (no quantities needed although I like a 50•50 mix with Rosemary hydrosol) for anti-aging and relaxation, and then use it. PLEASE NOTE: A true hydrosol should be specifically distilled for the hydrosol, not as a co-product or even a by-product of essential oil distillation. The plant’s cellular water has many components most are lost under pressurized short steam runs for essential oil, or by using dried material. We recommend that the producers specifically distill for a product by using plant material that is fresh. Portion of the plant used in distillation, how it’s distilled, extracted and yields: Balsam Fir and Silver fir needles are used in steam- and hydro-distillation. 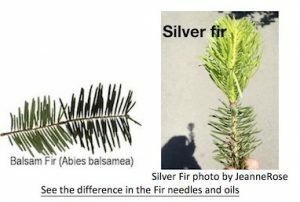 Silver fir yield is .25-.35% EO while Balsam fir is 0.65% essential oil, ranging to 1.4% or higher. Chemistry: Abies balsamea or balsam fir is a North American fir. Turpentine oil is produced from Pseudotsuga taxifolia as well as from Abies balsamea aka Canada Balsam Fir. This product is also a true turpentine because it consists of both resin and volatile oil. The chemical component is principally l-a-Pinene. Abies balsamea is Balsam Fir. It contains up to 90% Monoterpenes. It is antiseptic and antispasmodic and is inhaled for the respiratory system. Silver Fir oil contains alpha and beta pinene and is antiseptic if used externally or when inhaled for all respiratory needs. Burn the oil on charcoal for refreshing the air. FIRS = Think about Abies the genus and then A is for amiable (soft feel) or Abies and common name Fir is for friendly [Abies has needles that are soft to touch and aren’t sticky and the needles when pulled off leave a Flat scar]. Historical Uses and Interesting Facts: Abies alba is “the whitewood or silver fir, and the tallest European tree growing to 350 years old. It is much grown for construction work and telegraph poles and was favored by the Greeks and Romans for building fast warships, especially for oars of triremes (as it loses its lower branches early), but since 1900 is has been attacked by aphids and is now being replaced by the (deliciously scented) Grand fir, Abies grandis. It is a source of Alsatian or Strasburg turpentine called Vosges, essential oil is used in bath preparations and medicine especially respiratory uses when inhaled and is the principal Christmas tree of the Continent.”—Mabberley. balsamea is named by Linnaeus and is the balsam fir of North America. The pulp contains juvabione which is a homologue of insect juvenile hormone. (juvabione because of the ability to mimic juvenile activity in order to stifle insect reproduction and growth). This tree is used in North America for paper products and is also a source of Canada balsam which is used in microscope preparations and as a local medication and for Canada pitch. 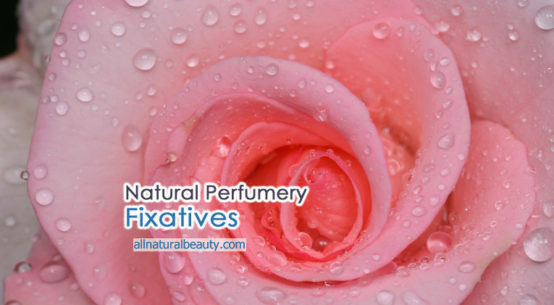 Perfume ~ There are few ingredients in a perfume that perform so well to make a scent both soft and attracting as well as masculine as the sweet, green, conifer (deep forest) scent of the Balsam Fir Absolute. All you need to do if you want this comforting scent of the forest is to add to your basic blend. I would suggest it in the blend up to 25%, although my favorites have always been about 15%. There is something deeply relaxing and compelling about this wonderful odor. Haircare – I rarely use the Fir oils and balsams in my hair care although I have on occasion added a drop to shampoo along with Rosemary CT. verbenone to assist in hair health. Body Care – The Fir oils are excellent to be used in all manner of skin care in amounts up to 15% of the total blend to condition the skin, add a forest scent, refresh the body in a lotion. 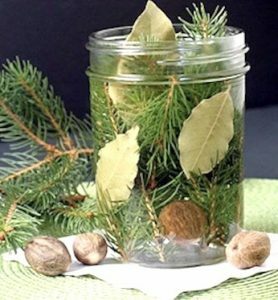 This is a beautiful potpourri that if made with fresh picked cuttings of conifers and bay and some nutmeg will make a wonderfully fresh-scented room deodorizer. 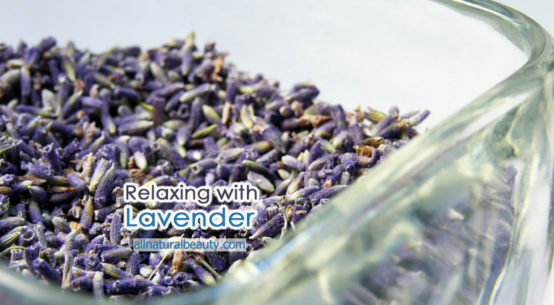 After a few days, make an infusion of the contents and throw into the bathtub for a soothing skin bath. The scent is so full, resolute. About 30 drops total and add 15 drops of the diluted Balsam Fir Absolute. Add or reduce these oils as you wish. Muscle relaxation or for inhalation for the mind. 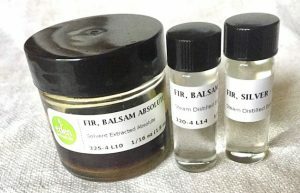 Source: I am very fond of the needle oils including the Firs that come from Eden Botanicals. Miller, Richard & Ann. The Potential of Herbs as a Cash Crop. Acres USA. Kansas City. 1985. Rose, Jeanne. Herbal Studies Course, Jeanne Rose – Institute of Aromatic & Herbal Studies, 1992.